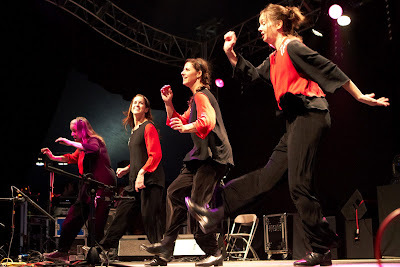 The Footworks dancers kick it up at the 2011 Shrewsbury Folk Festival. CHESTERTOWN, MD—The internationally acclaimed Footworks Percussive Dance Ensemble, which The Washington Post called “the Bolshoi of Barn Dancing,” is coming to Chestertown July 19 for the final evening of the popular Washington College Riverfront Concert Series. As was the case in the first two performances of the 2012 series, this one will include a special birthday tribute to American folk icon Woody Guthrie, who was born 100 years ago on July 14, 1912. Based in Annapolis and inspired by the old-time buck dancers and flatfooters of North Carolina, Virginia and Tennessee, Footworks has been delighting audiences since 1979 with its explosive performances, “kicking out a dazzling array of hard shoe clogging routines from around the world,” according to The Scotsman, Scotland’s national newspaper. Known for their innovative choreography and commitment to Southern Appalachian music and dance, they have explored the roots of the genre, collaborating with and enlisting the masters of traditional percussive dance from Irish and Scottish to African American traditions. They performed as guest artists in the London run of Riverdance and were one of eight groups chosen to represent American culture in Japan on a tour with the Smithsonian Institution. They have performed at the Kennedy Center, Lincoln Center and the Glasgow Royal Concert Hall. The free public performance, hosted by the C.V. Starr Center for the Study of the American Experience, begins at 6:30 p.m. behind the Custom House, corner of High and Water streets in downtown Chestertown. Attendees are encouraged to bring their own blankets, lawn chairs and picnic dinners. Lemonade and cookies will be provided free of charge. In case of inclement weather, the event will take place in The Egg, a performance space in Hodson Hall Commons on the main Washington College campus. For more information about Footworks, visit their Web site at http://www.footworks.org/. For information about the concert series and other Starr Center programs, visit starrcenter.washcoll.edu or call 410-810-7161.